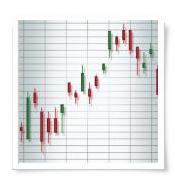 Most successful technical traders or investors use stock charts to view the technical price variations that occur on a moment to moment basis on the stock market. Beyond Charts includes a number of widely recognised chart styles such as Bar, Candlestick, Line, Base 100 and Renko. Users have the flexibility to view end of day charts over a variety of time periods in Daily, Weekly or Monthly mode. Below is a list of the charting styles currently offered in Beyond Charts. A bar chart represents the open, high, low and close prices experienced in a fixed time interval, in a single drawing element. The vertical line is drawn between the highest and lowest trades prices and the horizontal marks show the open(left) and close(right). The bars can be coloured differently depending on whether the price closed higher or lower than it opened. A candlestick chart is a style of bar-chart that was originally engineered by the Japanese. It's only concern is price movement in a fixed time interval; it's not concerned with volume. It represents the open, high, low and close prices experienced in a fixed time interval, in a single drawing element. The top and bottom wicks illustrate the highest and lowest traded prices and the body illustrates the difference between the open and close. Our candles can be coloured differently depending on whether the price closed higher or lower than it opened. A Line Chart is created by connecting a series of data points together with a line. This is one of the most basic types of chart style used by traders and investors. An extension to the standard Line Chart is a coloured line chart. Again with the use of 'Up' and 'Down’ colours you can quickly and visually perceive the rise or fall and trend over the selected period. Used to compare the performance of one or more securities, a Base 100 chart resets the price at a specified point in time. A renko chart is only concerned with price movement; time and volume are not included. Developed by the Japanese, the name derives from the Japanese word for brick, "renga". A renko chart is constructed by placing a brick in the next column once the price surpasses the top or bottom of the previous brick by a predefined amount. Solid bricks are used when the direction of the trend is up, while hollow bricks are used when the trend is down. This type of chart is very effective for traders to identify key support or resistance levels.